The Taj Sawai Madhopur Lodge is located in 12 acres of spacious gardens. It was built in 1930 by Maharaja Sawai Man Singh II of Jaipur as a lodge for his hunts in Ranthambore which at that time was the hunting preserve of the Royal family of Jaipur. This 75 year old hunting lodge has a lot of history. 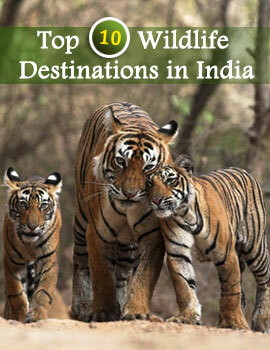 It is one km from the station and a 20 minute drive from Ranthambore National Park. It has Standard Rooms, Superior Rooms and Suites. The Suites are part of the original accommodation used by the Maharaja of Jaipur and his personal guests. Queen Elizabeth and Prince Philip stayed in these suites during their visit. From October to March spacious tents are pitched. Every tent has a canopied bedroom with a permanent structured dressing room and bathroom. Business Services include Business Center offering fax, email, Internet and photocopying. Dining is both Indian and Continental, and is either in the Dining Hall, or in the Neem Terrace which is an open-air terrace. For recreation there is wildlife slide show, nature talk, badminton, croquet, tennis, pool table, jogging, bicycles, and body massage. Visits can also be organized to Devpura for seeing Black Bucks, and to Mansarover and Soorwal for bird watching.